(2:50 p.m. EDT) -- Something funny will take place on Carnival ships during the next five years, and it's going to cost the cruise line upward of $500 million. 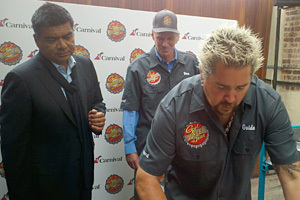 The ambitious modernization program, dubbed Fun Ship 2.0, will encompass 14 ships in the fleet and incorporate concepts introduced on Carnival Magic -- plus numerous new features, including several overseen by Food Network guru Guy Fieri and comedian George Lopez. During a boisterous news conference in New York City, Carnival president Gerry Cahill introduced the program while the line's star cruise director, John Heald, kept things lively. "We want these spaces to create memorable experiences for our guests," said Cahill, as Heald bounced punch lines off the crowd. While the breadth of the program is impressive -- it covers dining, entertainment and bars/lounges -- its longevity took the crowd's breath away. It will begin this month with Carnival Liberty's dry dock and continue through the end of 2015. Some ships -- including Carnival Conquest, Carnival Glory, Carnival Freedom and Carnival Valor -- will not receive all of the features announced today. One in particular, Magic's innovative SportSquare and its ropes course, is particularly difficult to replicate because of the deck space necessary, Cahill said. One of the more compelling additions is Guy's Burger Joint, which is being overseen by Fieri and whose main draw will merge big slabs of beef, two kinds of cheese and, if the samples provided are any indication, lots of grease. Hand-cut fries are on the menu, too. The venue will be free of charge. The star chef, who admitted he's into "blowing people's minds," demonstrated his burger-grilling skills to the crowd -- prompting Lopez to hop on the stage to get a closer look. For his part, Lopez is the new Curator of Comedy for the cruise line -- in other words, he'll be overseeing the comedy offerings across the line at The Punchliner Comedy Club Presented by George Lopez. Lopez admitted he's never been on a cruise before; that will change later this year. "I'm taking a cruise to Mexico," he said. "I'm told I can come back." The onboard comedy shows, long an evening entertainment staple on Carnival, will be joined by a comedy brunch in the main dining room. Cahill pointed out that the comedy program will be instituted across the fleet with relative ease, inasmuch as it needs no dry dock. Ditto upgraded music fleetwide, courtesy of celebrity mixmaster D.J. Irie, who becomes Carnival's official D.J. He'll oversee Spin'iversity, in which current Carnival talent will learn secrets of the trade. Other new bars include the Library Bar (with a self-serve enomatic wine system); EA SPORTS Bar (think lots of beer and big screens to watch the Big Game); and Alchemy Bar, which takes an electronic page from Celebrity's Qsine in that it will allow patrons to mix their own concoctions via electronic tablet. As for dining, the BlueIguana will have a separate dining component, the BlueIguana Cantina, a free eatery that will serve burritos and tacos on ship-made tortillas. Besides the Lopez contributions to onboard entertainment, Hasbro, The Game Show will permit passengers to play upsize Hasbro classics onstage on giant screens. In addition, Playlist Productions will incorporate current hit music into a quartet of 30-minute "high-energy" shows that will mix LED effects with live performances. Opinions of the new additions from Cruise Critic members have been mixed so far. Join the discussion on the message boards.